BANKE, Aug 20: The Postal Highway, one of the most prioritized projects of the government, is currently in a miserable state. Continuous rainfall has caused serious damages in various sections of the highway in the mid-western region even before its completion. This often obstructs vehicular movement along the highway leaving passengers stranded for hours. This has compelled the locals living near the Rapti River to go through great ordeal to reach to other places. "The condition of road started degrading since the onset of monsoon," said Jhup Lal Bista, adding, "We are unable to reach to our destinations due to this." It is not just the torrential rainfall but overloaded cargo buses and tippers, which have further deteriorated the condition of the Postal Highway. Another local Ram Parasad Tharu says this is not the first time that the locals have faced such ordeal as this happens during every monsoon. 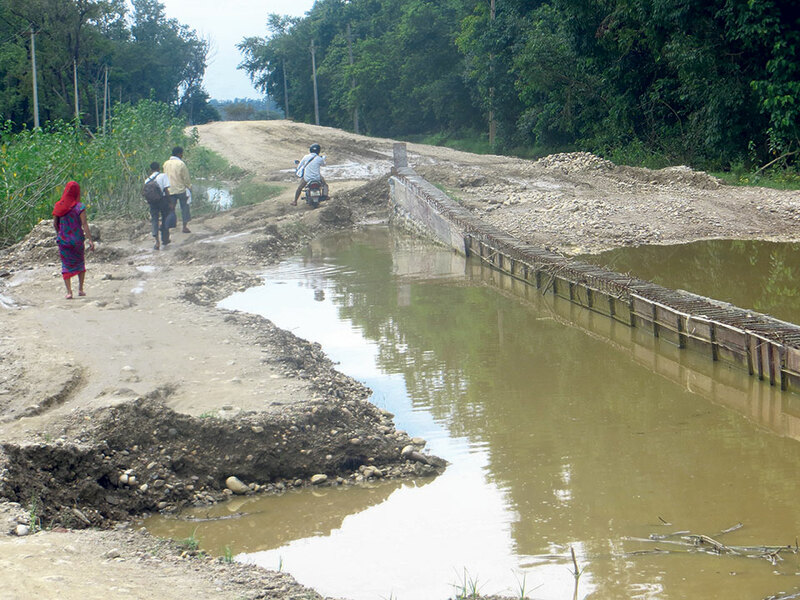 "Vehicles can hardly move along the road after rainfall," said Tharu. As the construction and maintenance work of the highway is a never-ending process, the locals living near the Rapti River are often at the receiving end. After the Indian contractors left the project halfway, the government has been constructing the 44 km section of the Postal Highway in Banke district on its own. Pappu-Lumbini JV was awarded with the contract for Rs 665 million. This company officially kicked off the project on March 16, 2017. As per the agreement, the contractor must complete the project within 30 months. Pappu- Lumibini JV has assigned Ganapati Group of Construction Company for some of the work. Currently, construction is underway between Pushpa Lal Chowk of Nepalgunj to Nankaupur of Fattepur. The sorry state of the highway has given headache to the elected representatives as well. Ramlakhan Tharu, chief of Raptisonari Rural Municipality-7, says that monsoon scares the locals here because they have to travel through the Postal Highway which is in a pathetic state. Tulsiram Bhandari, managing director of Ganapati Group of Construction Company, blames the rain for the bad condition of the highway. "Potholes are common in monsoon but we are trying our best to help people get rid of them," said Bhandari. He claimed that the project would be handed over to the government by the next fiscal year. Locals on the other hand blame the sluggish work of the contractor and the project office for the delay in the completion of the work. According to Postal Highway Project Office (PHPO), the contractors are currently laying gravel on the road. Krishnanath Ojha of the PHPO says that the project is likely to push for the deadline extension due to the snail-paced work of the contractors. "The company has only completed 30 to 40% works so far," said Ojha, adding, “So, it may take some more months for the project to complete."